Dine with an Astronaut buffet lunch experience. A buffet lunch that varies seasonally. Generally, consists of a meat, pasta, vegetarian options, and a dessert. Iced Tea, Soda and Coffee are also included. 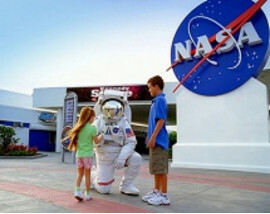 Upon arrival at Kennedy Space Center Visitor Complex Gray Line guests will receive an exclusive welcome from an Astronaut that will give them some hints and tips to enjoy their day! 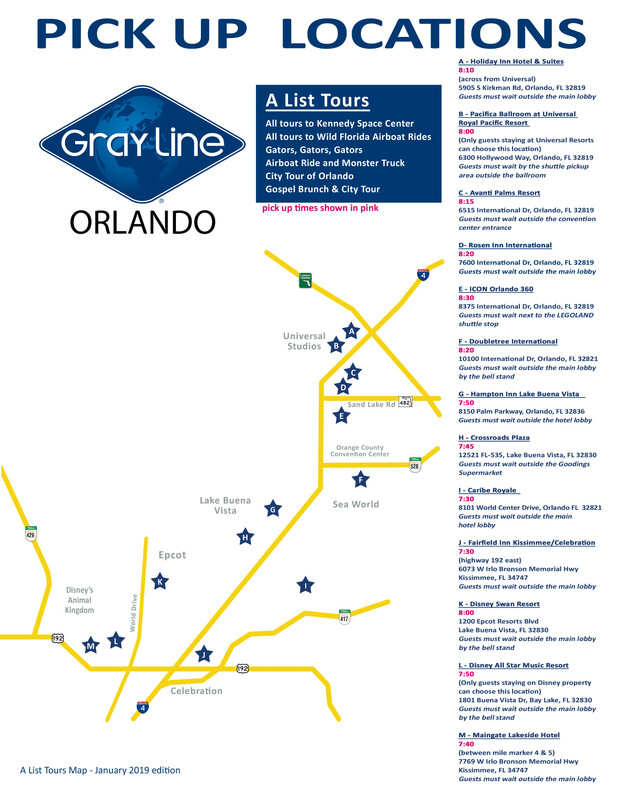 The Astronaut Meet and Greet is a value-added bonus only for riders of Gray Line transportation however please note this is a complimentary added bonus that can't be guaranteed but happens most days only with Gray Line! 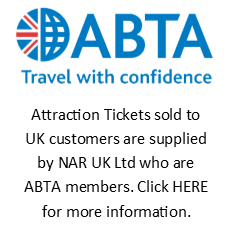 Following the Astronaut Meet and Greet the tour guides take the guests over to the Space Shuttle Atlantis for a brief highlights tour of the facility, before leaving the guests to enjoy their day at their leisure. Then they have the morning to explore the visitor center complex. Starting point must be the SPACE SHUTTLE ATLANTIS! 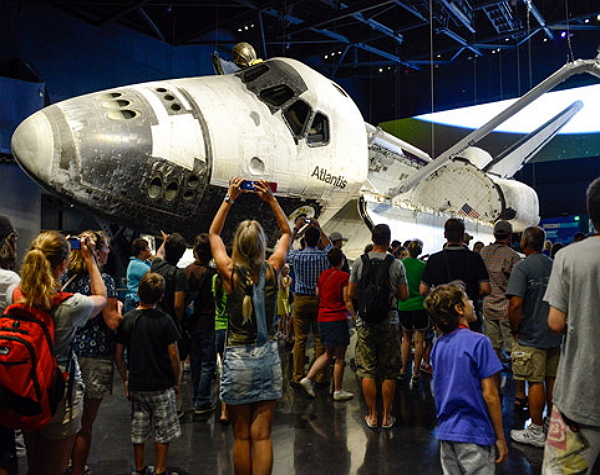 This exhibit is the world’s most comprehensive attraction devoted to the space shuttle, it brings visitors nose-to-nose with the priceless Atlantis spacecraft as only astronauts have seen it before – with payload bay doors open as if it were floating in space. More than 60 interactive, touch-screen experiences and high-tech simulators invite guests to “be the astronaut,” bringing to life the people, passion and patriotism behind NASA’s 30-year Space Shuttle Program as well as the complexity of the engineering marvel that launched the Hubble Space Telescope and built the International Space Station (ISS). Guests can conduct a virtual EVA or extravehicular activity; practice docking to the ISS; extract cargo from the payload bay; create sonic booms and glide to a landing on the Re-entry Slide; experience the sensation of floating in space; explore a high-fidelity replica of the ISS; virtually mate Atlantis to the external tank; kick up a virtual chemical reaction to launch the shuttle; get an “X-ray view” of Atlantis’ interior; experience an orbital sunrise; strap in to the sights, sounds and sensations of a shuttle launch; take the helm at the shuttle cockpit, and much more. During the lunch period, you will enjoy the Dine with an Astronaut lunch, which is served buffet style. 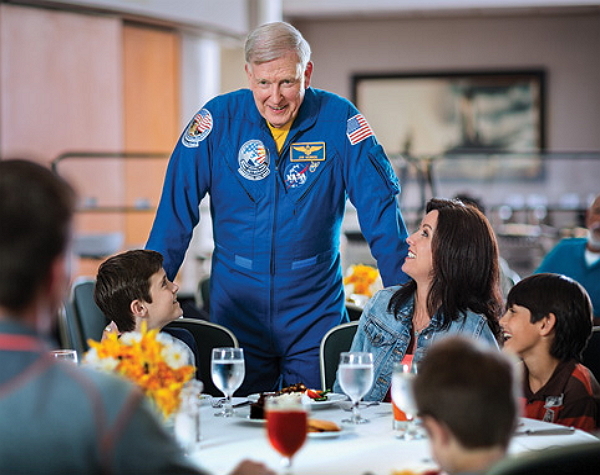 During the delicious meal, you will have an up-close and personal opportunity to speak with an Astronaut and hear personal stories from one of NASA’s best. You can even have photos taken together to remember the experience forever! Lunch has many options, something for all tastes and includes desert plus sodas, ice tea, water and coffee - you must eat lunch during the day, so this is the best option available on complex! 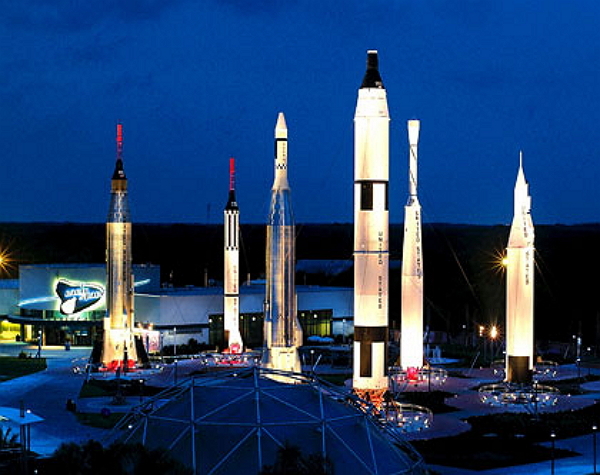 Following lunch, you should ride the NASA Bus Tour. 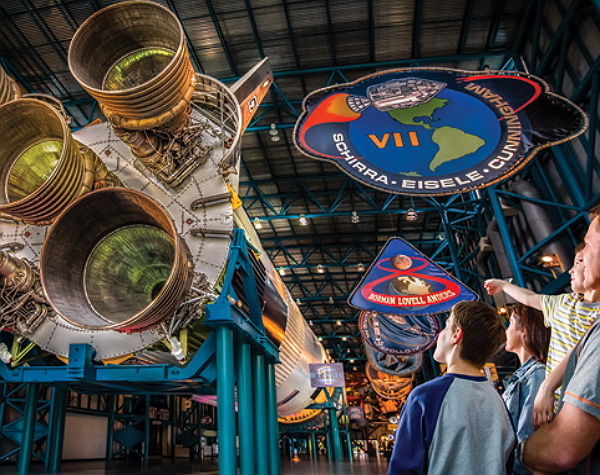 This will allow you to tour restricted areas, walk beneath the massive Saturn V rocket, and touch a piece of moon rock - defiantly something not to be missed. 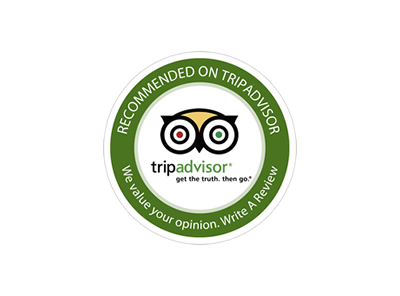 Your time in the Visitor Center is yours to enjoy independently so you can see what is important to you. This is a great day that is truly out of this world!